This week most TV shows came back from winter hiatus, so it was a busy time in front of the tube, and most shows came back with a bang. Chuck: "Chuck Versus the Pink Slip"
The winter TV season kicked off with a bang with the return of last year's fan and critical darling, Chuck, making its third season premiere. I, like all of the Chucksters, was pumped to have my favorite spy dramedy back in action, but I have to admit the first episode was a little flat. 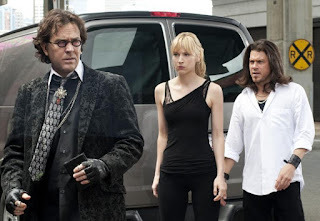 In my opinion, Chuck spent too much time moping around after being fired by the NSA, and it took a while for the episode to find any real direction. Also, while I love the Chuck/Sarah stuff, I think they went a little too overboard with the relationship drama. Chuck: "Chuck Versus the Three Words"
The second hour of the big two-hour Chuck premiere was a little better than the first. The spy stuff was really kicked up a notch, but the relationship stuff still dominated the majority of the plot line. Again, I like the Chuck and Sarah romance (unlike most TV 'ships), but too much is a killer, but I did feel the second episode of Season 3 was more balanced. It was also nice seeing Carina come back, and Vinnie Jones was a pretty decent guest star. 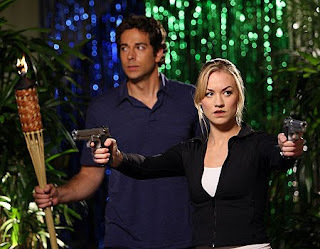 Chuck: "Chuck Versus the Angel de la Muerte"
Man, there was a lot of Chuck in a short amount of time. "Angel" was probably the best of the first three episodes of the season because it was a great combination of action, comedy, and lovey dovey stuff. It was also one of the better Casey-heavy episodes. Also, the mini-Captain Awesome story arc kicked off, and this week's episode really did a great job at getting us ready for next week's "Chuck vs. Operation Awesome". I haven't pulled any punches when it comes to my thoughts on How I Met Your Mother. It's been in a creative slump for the last couple of seasons, but every once in a while I good episodes surfaces and reminds me why I love this show. Monday's "Girls versus Suits" had the opportunity to be one of those episodes. The Ted plot was pretty good because it was one step closer towards finally meeting the mother, and plus I'm in favor of any story line that gets Rachel Bilson on my TV screen. The Lily/Marshall/Robin debate about the hot bar tender was tired, and Robin is becoming annoying. I never thought I'd say that. Barney hooking up with said bar tender (who hates suits, thus making him choose between her and his uniform) had its laughs, but the musical number at the end was killer. 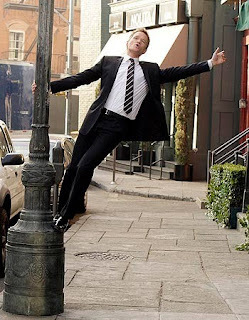 NPH once again proved how truly awesome he is. 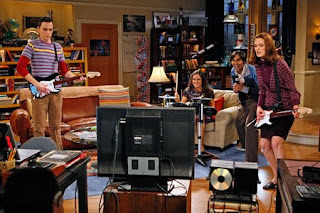 The Big Bang Theory: "The Psychic Vortex"
Castle: "A Rose for Everafter"
The buzz around this week's Castle revolved around Alyssa Milano's guest spot as Richard Castle's one that got away. Of course, the best part of this episode had nothing to do with the dead bridesmaid, but the chemistry between Milano & Nathan Fillion, and the jealousy displayed by Stana Katic's Detective Beckett. "Everafter" wasn't the show's best outing, but it was entertaining, and hopefully the Milano appearance brought in some new viewers. Better Off Ted: "The Impertence of Communicationizing"
I'm a big fan of Better Off Ted, but one of its weaknesses is its inconsistency. For every excellent episode like "Racial Sensitivity" or "The Great Repression", we get a subpar ep like this week's "Communicationizing". 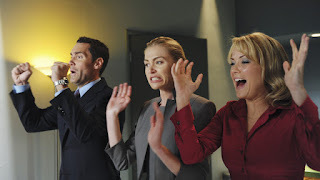 The plot had potential, a memo encourages Veridian employees to insult one another, but most of the jokes fell flat. Scrubs: "Our Stuff Gets Real"
Apparently, Scrubs wanted to sneak in an old school episode in the middle of the Scrubs 2.0 season because this week's "Our Stuff Gets Real" had Scrubs Classic written all over it. J.D. and Elliott are getting ready to have their kid, Dr. Cox is getting pressure from Jordan to sign a will, and Lucy has to cut the body of a patient she thought of as a friend. The OG Scrubs storyline would've worked well last season, but with the reboot going on, it kinda felt like a big tease. Better Off Ted: "The Long and Winding High Road"
The Better Off Ted/Scrubs burn off is in full swing, so we got two new Ted episodes this week. The second episode of the night was back to the show's biting satirical stylings that so few people appreciate. The main storyline focused on Ted's rivalry with another R&D guy at Veridian, and his taking the low road to get his project greenlit first, but it backfires thanks to Veronica and Linda. One of the best shows on cable made its winter debut this week, and it didn't disappoint. 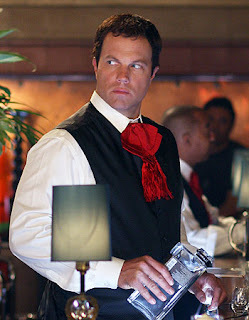 Nate and the Leverage crew took on an aspiring designer/sweatshop owner/Triad, and conned the mark by stealing a fashion show. The episode had good action and humor (Eliot in guyliner) which is expected from the show. Also, this was the first job that Tara Cole (Jeri Ryan) pulled with the Crew. Many fans are against Tara, but I think she's a breath of fresh air...mostly because I'm not a fan of Gina Bellman's Sophie. While the episode was good, we didn't have nearly enough Eliot, Hardison, and Parker for my liking. Bones: "The X in the File"
Apparently, this week's episode of Bones was supposed to be an homage to The X-Files, but since I never watched the latter, most of the inside jokes fell on deaf ears. The case of the week was OK, the B&B stuff was OK, and Squints were annoying (Angela & Hodgins shouldn't be together so they should both move on). Overall, a mediocre episode. So, it was a busy week back from winter break, and there were more hits than misses, which is hopefully a good indicator for the rest of the season.